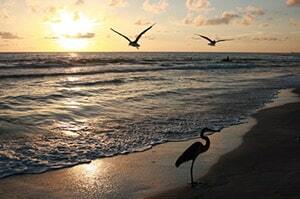 Known as the more “reclusive” of the Sarasota barrier islands, Longboat Key is home to some of the most beautiful and quiet beaches in the area. Whitney Beach is a hidden gem on Longboat Key and is a local favorite. Less than 11 miles long, Longboat Key only has a handful of public access points, making it a quiet and relaxing option for your Sarasota beach vacation. Whitney Beach, located on the northwestern-most tip, is definitely one you won’t want to pass up. More so an enclave, Whitney Beach still offers plenty of shoreline to explore and beach comb. It’s not unusual to see fishermen from the shore or a small craft beached on the shore, just like a modern version of old Florida. One thing that makes Whitney Beach unique is the purity of it. There is limited parking and no amenities, like the ones found on other Sarasota beaches. Just you, the beautiful white sand beach, and clear light blue and turquoise water. When visiting this gorgeous, isolated beach be sure to bring all of your beach vacation essentials. While exploring Whitney Beach, you may find some long fallen trees. If you look through the trees you can see Anna Maria Island’s Coquina Beach, its southern most beach. Also, if you walk out to the far northern tip of Longboat Key and around the bend you’ll reach Greer Island, a.k.a. Beer Can Island. It’s not really an island at all however; it’s a peninsula that looks out onto Longboat Pass. These are all great places for shell collecting, scenic photography, and hiking. If you’re looking for a new beach to explore on your Longboat Key vacation, be sure to check out the pure beauty of Whitney Beach. And to find the best Longboat Key vacation rental, contact Jennette Properties today!